Holland, established in 1936, has been serving Tulsa and the North East Oklahoma area for over 75 years. Our team, consisting of skilled professionals ranging from Licensed Landscape Architects to certified Technicians, provide our clients with highest level of skill, and knowledge with over 150 years of professional experience. When designing a yard, our team emphasizes the outdoors as an expansion of the living space. It must include elements that stimulate the five senses. Sight, sound, smell, taste and touch. 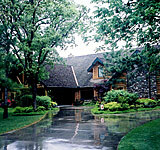 It must have year-round beauty while keeping maintenance to a minimum. 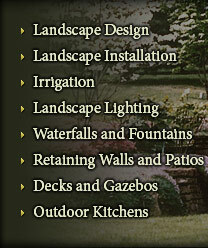 Holland is a full service landscape design, installation, and maintenance company. We service all our products and provide a limited warranty on all our projects. Call us for warranty details.. As a customer of Holland, please feel free to call us for assistance or about maintaining your grounds and landscaping. Holland is a proud member of the Better Business Bureau. Holland Landscape's services include landscape plantings; patio, and swimming pool design; pergola and decks; outdoor kitchens and fireplaces; fountains, and waterfalls; landscape lighting, landscape sprinkler and mist systems; Belgard patios and retaining wall systems. Everything you need to complete the development of your landscape project is provided by Holland. Holland Lawn Care’s services include standard turf maintenance, landscape maintenance, trimming services, weed and fertilizer treatments, leaf removal, and sprinkler system maintenance. Our maintenance division is dedicated to maintain year round beauty of your outdoor investment. Contact us today for a free no obligation estimate for your project (certain restrictions apply). We look forward to working with you to make your outdoor space an extension of your home. Holland Landscape, Landscapes that are different!